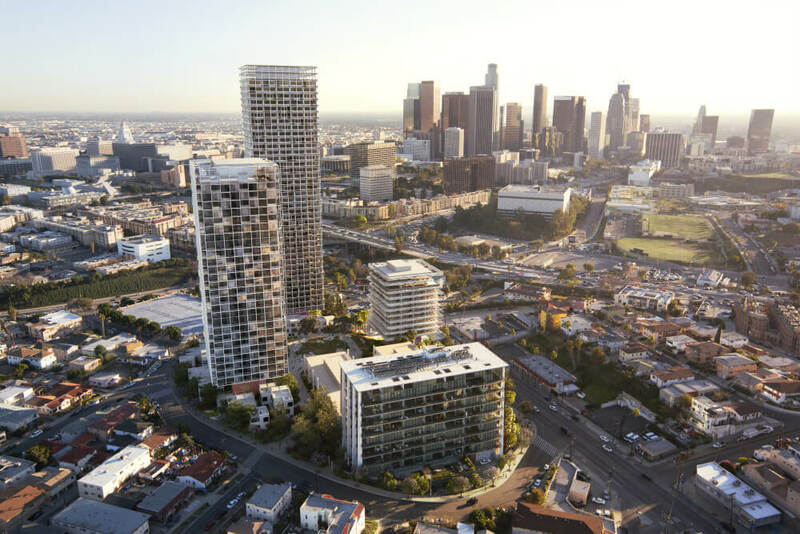 Kengo Kuma and Associates and Natoma Architects have been added to the project team for the recently-revealed 1111 Sunset Boulevard development slated for the former Metropolitan Water District (MWD) headquarters on the edge of Downtown Los Angeles. The announcement of the expanded team—which also includes SOM and James Corner Field Operations (JCFO)—came this week along with a fresh set of renderings for the 5.5-acre project. 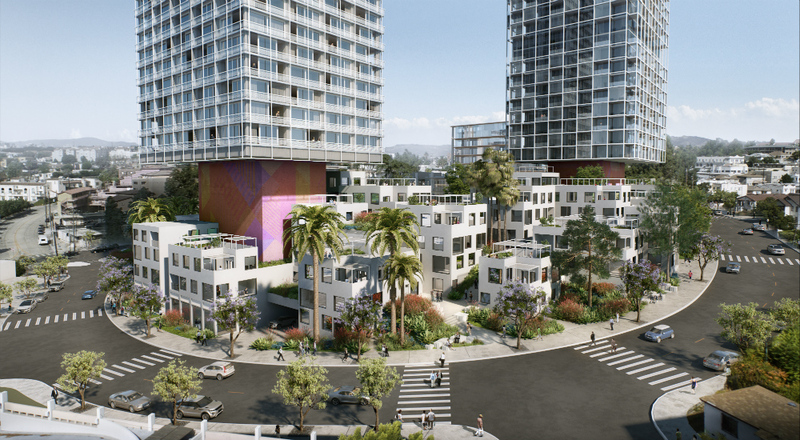 With the project, Los Angeles–based developer Palisades is looking to transform a derelict section of William Pereira’s MWD headquarters into a 778-unit mixed-use enclave containing retail, public open spaces, and a boutique hotel designed by Kuma. 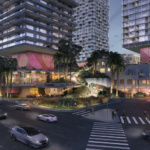 The development consists of three high-rise towers that sit atop a continuous and permeable podium spanning the sloped site. 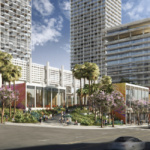 According to the renderings, the complex will contain a cluster of low-rise apartments at one corner surrounding underground parking for a pair of housing towers. As those apartments terrace up the hill, they will give way to a shared plaza at the base of the high-rise towers. Project renderings depict a pair of 30- to 40-story tall towers along this section of the site. Each of the towers rises from the podium on a gigantic pod containing a solid, monolithic core. Roughly five stories up, the tower’s typical floor plates begin to cantilever over the plaza, leaving an open viewshed several stories high from the plaza. 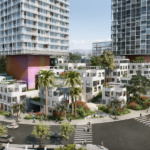 The move is an attempt by the designers to minimize the heft of the project along its lower levels and an effort, as well, to preserve certain views for existing hillside residences located directly behind the development. 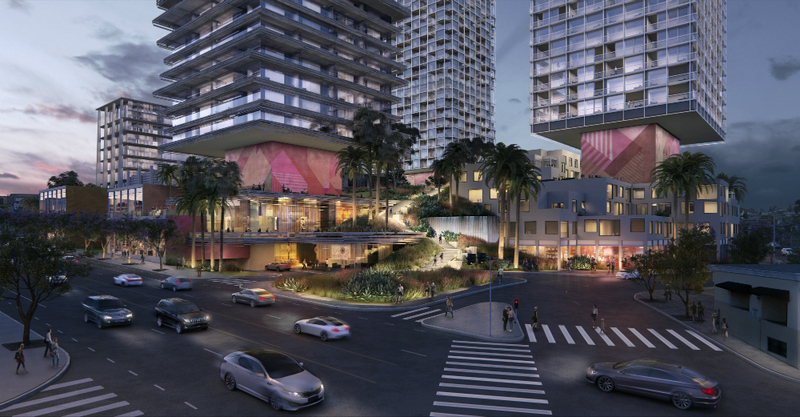 The renderings also depict certain portions of the Pereira structure reused as ground floor amenity spaces. 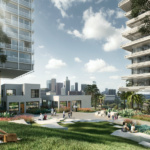 JCFO is developing the project’s more than two acres of landscaped areas. 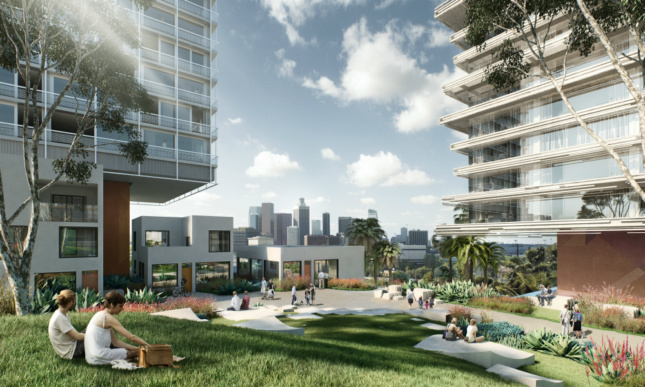 In terms of plantings, renderings depict clusters of palm trees, jacaranda trees along the street, and succulent-bordered lawn areas overlooking Downtown Los Angeles. 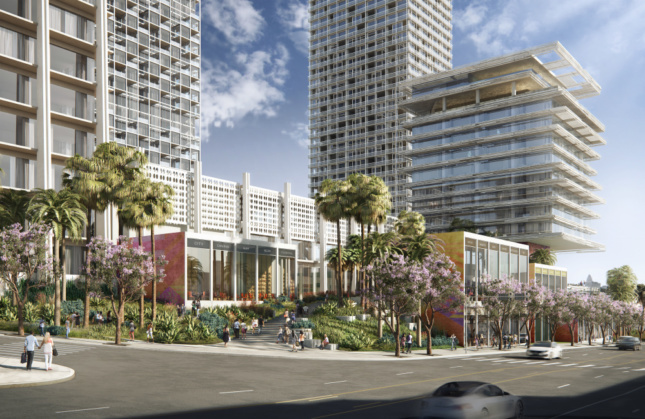 The project will share the site with Linear City’s Elysian tower development, a portion of the existing Pereira-designed complex that David Lawrence Gray Architects repurposed in 2014. 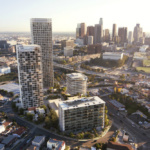 111 Sunset is among several high-rise, high-density projects slated for the area. An official timeline for the project has not been released. See the project website for more information.